When an installation (or any exhibition or work of art in general) requires fairly extensive interpretive text as well as the artist's statement in order to be understood in the slightest, something has gone wrong. A failure to bridge the divide between artist and viewer has occurred, leaving the viewer scrabbling for any kind of minutiae that will give the art experience meaning. Gabriel Sierra's The First Impressions of the Year 2018 at the Vienna Secession was such a show. Despite hints of potential in some of the details of the installation, it ultimately fell flat in what it is trying to convey, relying far too heavily on the accompanying text and thus failing to be entirely engaging. According to said text, this installation was meant to be a meditation on the nature of time and a way for the audience to consider the future in the present moment--thinking about 2018 as we stand in the nascent year of 2017. While there were arguably elements of the experience of this installation that could ostensibly support the artist's aims, the viewer should not have had to rely on the text's explanation to this extent in order for the show to have any resonance or significance. It set up the viewer for the experience in a reverse-engineered way, almost, trying to excuse any flaws in communication of the artwork itself by simply providing the missing links in the text. The installation took place over several rooms on the lower level of the Secession building and was comprised of large pale pink alcove-like forms that covered the walls they are on, creating a tense play of projection and recession as the bottom ledges of the forms jut out into the viewer's space while simultaneously leaving the interior corners of the forms in deep, overlapping shadow. 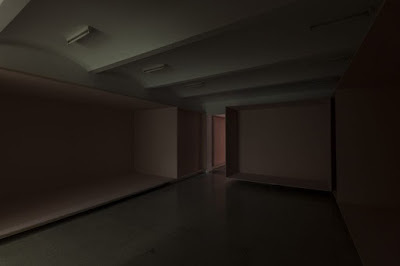 The three rooms in which these forms were located all made use of whatever ambient light was already present, almost evoking a feeling of discovery and explanation as the viewer moves from darker to more brightly-lit spaces. The first room of the installation was almost completely dark because the interior room it was located in lacked windows or opportunities for natural light. As my eyes adjusted to the darkness, I began to notice the shadows within the forms themselves, and what turns out to be a fairly enchanting range of hues and values. The last room of First Impressions of the Year 2018 incorporated the small high windows that provide welcome daylight into the pink forms. On a sunny day like the day I visited the Secession building, the light quality seemingly changed from minute to minute, going from cold to warm, the delicate pink of the forms turning crepuscular with deepening shadows as the day wore on. Despite the variation in color and spatial awareness created by the varying levels of brightness, this interplay of light is where the visual intrigue ended, and I found myself turning to my other senses in order to try and put these rather simple box-like forms into some kind of context. In the overall quietude of the space, I heard an incredibly faint high-pitched noise that almost crackled with static. I also noticed that the paint used on the forms left a lingering odor, as if the pink had been applied only days earlier. If I were trying to make the elements of Sierra's installation as I experienced it fit in with his ostensible goals as spelled out in his text, I could perhaps take the cognitive leap and link the new-ish smell of the paint to some abstracted idea of the "new year" and "new beginnings," but again, coming to this tentative conclusion seemed like an outsized attempt at justification. Likewise, any attempt to incorporate the ambient sound of the static, which was probably just coming from the exit signs, felt like an overreach on my part. Perhaps I ought to have spent more time in the installation itself--perhaps I ought to have sat on the floor in one of the rooms for good long chunks of time, allowing my eyes to adjust to the relative light levels in each room before moving onto the next. Perhaps then First Impressions of the Year 2018 would have conveyed something more. Yet I am not certain that more time would have solved the problems of the work and how its better impulses--such as the interplay of the forms' deep corners, the way that one form casts another's corners into obscurity by necessity of how they are arranged--are overshadowed (pun intended) by the elements that require the exacting explanation of the exhibition text. If First Impressions of the Year 2018 had made better use of the inherent intrigue of the balance between shadows and illumination based on the forms themselves, or if the installation had been set up to guide the viewer from lighter to darker spaces (rather than vice versa), perhaps it would have resonated more deeply. After all, at the beginning of a new year, the future seems dim and hazy and unknown, with the complete unfathomable quality of the years to come looming in the background, drenched in darkness.